"Growing together in God's Love"
A warm welcome to all of our visitors here at Clayton St John C of E Primary School. We learn and grow when things go well and things go wrong. In all we do we hope to be the best we can be. 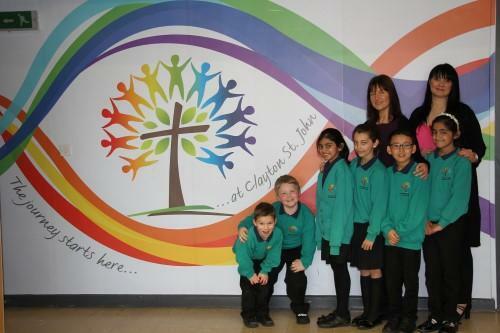 Our school is situated at the heart of Clayton, and is an important part of the community. We are a part of Bradford Diocesan Academy Trust (BDAT), a multiacademy trust developed by the Diocese of West Yorkshire and the Dales. Alongside this collaboration, we also have strong associations with our local schools, St John’s Church and our Local Achievement Partnership. These links strengthen our offer to our pupils, staff and wider community. At Clayton St John, we are developing a curriculum and learning environment that promotes interest, excitement, motivation, achievement and success. Christian environment. We welcome children and their families from all faiths, beliefs and those who hold no specific religious beliefs. Please contact staff in the Main Office if you would like to arrange a suitable time to visit our school. If you require any further information please do not hesitate to contact us.